The Run Networks Automator App works with ConnectWise to increase the efficiency of technicians while inside or outside the office. 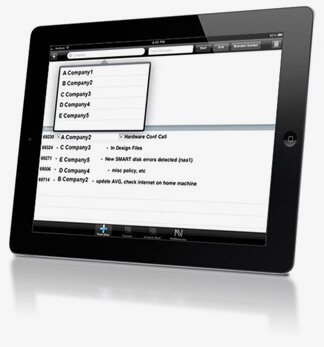 Capture unbilled time by quickly entering it through the Run Networks Automator iPad/iPhone app. Enter time directly into ConnectWise from your iPad/iPhone. Avoid the hassle, enter your time and move on to the next project. Quickly search contacts to find what you need to be efficient. Because the Automator is a native application on the iPad/iPhone, there is no clumsy web interface to deal with, and ticket entry goes from browsing through numerous pages to a quick, one screen process. Plus, the Automator uses the ConnectWise API to quickly add records right into your database, so there is no sync to wait on. Either create a new ticket and time entry in one process, or add time to tickets you worked on in the last three days or has been assigned to you. The clean interface lets you enter a ticket and time entry in 20 seconds or less. Search contacts and get the main office and primary phone for the contact as well as one tap access to send email or call.